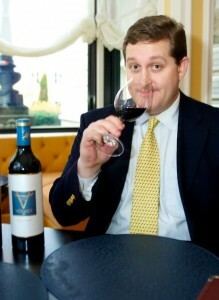 Greg McGehee is the general manager and wine director for Lemaire in the historic Jefferson Hotel in Richmond, Va. He served DO La Mancha wine at his wedding. Greg McGehee with a bottle of Volver, which he served at his wedding. 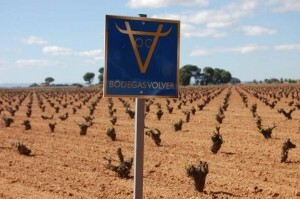 April 11, 2011, was a warm morning in Albecete when we left our hotel to travel to the vineyards of Bodegas Volver. I found myself on the tail end of Jorge Ordonez’s “death march,” which had taken me all over Spain’s greatest vineyards that lasted 10 grueling days. It was appropriate that this vineyard would be our last that we would visit. When Jorge would talk about this vineyard one could hear how proud he was of this project. We arrived to the site and immediately I could see why this was a special wine. The vineyards seemed to go on forever, on what was a perfectly flat, rocky surface with plenty sun exposure. The vines had not yet begun bud break but one could tell that they had to work for any little water they could find in arid environment. After a brief tour, Jorge promised a lunch of epic proportions. After all of the great meals I had experienced while on this trip, I was somewhat hesitant to believe him but I was soon quickly made a believer. After meandering through small town streets we arrived at Las Rejas restaurant for the best lunch of my life. As we walked into this one-star Michelin restaurant we were greated with plates of Iberico jamon, sardine filets simply dressed with Spanish olive oil and of course a glass of Volver tempranillo. Joining us at lunch was of course Jorge Ordonez but also Rafael Canizares, the winemaker of Volver and Victor de la Serna of Finca Sandoval. Words cannot describe how perfect his meal was, food was out of this world, wine was flawlessly paired with it and the company was perfect. This tour of Spain particularly made a lasting impact on my life personally and professionally. Professionally, it opened my eyes to endless styles of Spanish wine and how important food and wine are together in creating an ideal dining experience. Personally, this trip introduced me to some of my favorite wines, including Bodegas Volver, which was the red wine served at my wedding later that same year in July.